Jump right in anytime. - The right heater fo you! POOLS AREN’T CHEAP, so doesn’t it make sense to add a pool heater to add as much as 90 days to your swimming season for just a fraction of your original investment? We think so! While your neighbor’s unheated pool is empty you, your family and friends can swim in warm water for the lowest cost possible. No children with blue lips, no excuses for not having a pool party just warm water fun when you want it. And it's environmentally friendly too! 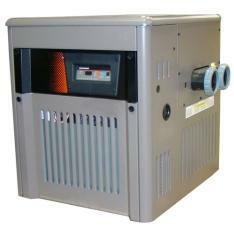 There are three types of heaters available for your pool: Electric, Gas and Heat Pumps. If you haven’t already guessed we are talking about HEAT PUMPs. 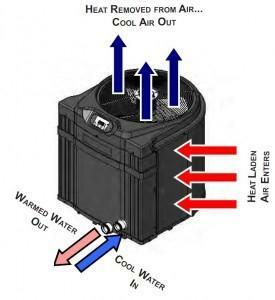 A heat pump is a machine that moves heat from one area to another. You may have a heat pump now heating your home using the outside air or geothermal as a heat source. If you own a refrigerator or an air conditioner you already own a heat pump! In those cases the heat is being moved from IN the house to OUTSIDE the house. In the case of a pool heat pump the heat is being removed FROM the outside air and put INTO the pool water. The beauty of a heat pump is its efficiency. Because a heat pump is not actually MAKING heat but rather MOVING heat, it is a fraction of the cost to use over other heater types. There are a couple drawbacks however. The first is what’s called ‘recovery’. The recovery is the speed that the desired temperature is reached. This is the same as we talk about a home water heater or furnace. A heat pump may take two days to bring your pool to the desired temperature verses one day using a gas heater but at a third of the cost. Most people think that’s well worth the tradeoff. The second down side to a heat pump is the NEED for heat in the air. We refer to this as the ambient heat. The less heat that is in the air the less efficient heat pumps are. If you try to heat your pool when the outside air is in the 40’s 50’s and even low 60’s – The heat pump will work but is not as efficient as it could be. This is not typically a problem because usually you’re not going to be swimming in those temperatures either. 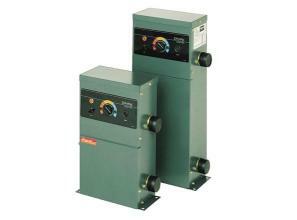 The second type of heater is a gas or oil fired heater. These are frankly the most common type of heater due to their cheap initial price to install and up until the last decade the only real option versus electric coil. Many pool builders use gas because they are cheap to install and clients like that...until they get their first gas bill. They can also be attractive to a family that needs a very FAST recovery time or wants to swim into the early winter (20-40 degrees F) or heat a hot tub when a heat pump will simply not pull the heat out of the air they need. This speed and ability to heat in the winter however comes at a cost. At the present natural gas per BTU is about THREE TIMES the cost of that yielded from a heat pump. In the Midwest (40 Latitude) there are very few customers that really need or should use gas. In northern climates gas may make more sense. In addition to the cost to operate gas heaters there is another downside to gas. Most gas heaters are made with copper heat exchangers. Copper is a metal that is sensitive to imbalanced water. If you don’t have perfectly balanced water OR you have a high level of chlorine you will quickly damage and perhaps ruin your heat exchanger. If you are planning on a salt chlorine heaters that are available cupro nickel heat exchanger that are much more resistant to corrosion but you will be looking at a similar cost to the heat pump counterpart that comes with a titanium lifetime warranty exchanger. The last type of heater is an electric heater. This is the absolute CHEAPEST heater to put in but the MOST expensive to operate. The heater works similar to your oven. An electric coil is heated up red hot with electricity and water runs around it. Twice as much as gas and not even a consideration for 99% of all people. Electric heaters are also very susceptible to chemical damage just like gas heaters. The only application for an electric heater is for a spa or small pool that needs heat when the ambient heat is low and a heat pump could not operate and gas is not available. In most cases if a pool contractor is pushing you into an electric heater...RUN!